Copland DAC 215 review | What Hi-Fi? Danish manufacturer Copland has made an art out of understatement. Its products exude an air of Scandinavian cool in both clutter-free appearance and subtle sound. Since the brand was founded back in 1984, it has become known for its classy valve-based amplifiers and a series of fine premium CD players. But over the years the company’s product flow has been erratic, so when it brings something new out we’re eager to have a listen and so far, we haven’t been anything less than impressed. We’re pleased to report that the company’s first stand-alone digital-to-analogue converter, the DAC 215, maintains that fine tradition. The world is hardly short of digital-to-analogue converters with headphone outputs, but the 215 is a little different. It uses valves in its amplifier stage – a pair of ECC88s, visible through the grille on the front panel. There’s also a line-level analogue input. It’s something most of the competition don’t have, and makes the Copland a more versatile proposition. It can form the heart of a mixed analogue and digital set-up in a way that all-digital rivals just can’t. Look around the back and you’ll find the usual trio of digital inputs – USB, optical (two) and coax – and two pairs of single-ended outputs. One of these is plugging the Copland directly into an existing preamp section and using it solely as a standalone DAC, the other, marked ‘Amplifier’, makes use of the valve circuitry and should be connected when you want to use the 215 as a preamp. That’s right, the valves only come into play when the analogue preamp circuitry is needed (and when headphones are used). There’s a small toggle switch on the front panel to turn this function on and off. There’s no display as such, just a series of LEDs that show that sampling rate as a base – 44.1kHz and 48kHz – and multiples- x2, x4 and x8. It sounds complicated, and even though we got used to it quite quickly, it would make sense to show the actual sampling rate instead. It’s a very un-Copland-like fuss, but the rest of the fascia returns to traditional values, with a minimum of controls and a clean simplicity in design. Our review sample is one of the first batch off the production line and a printing mistake results in the 48kHz LED being labelled as 48.2kHz. We’re assured all later units are correct in this respect. Look inside and you’ll find the much-respected ESS9018 Sabre32 Reference DAC chip. This is something that we find in many of the premium digital-to-analogue converters that come our way, and usually it gives good results. The use of the 9018 chip means that the Copland can accept PCM signals up to 32-bit/384kHz as well as DSD128 files. The general build quality is solid and neatly finished. It looks smart, especially in the silver fascia option, though the black alternative is neat too. The DAC’s controls work with precision and give the 215 a feel of something designed with care. Once warmed through, this is a hugely talented device. We start off using it with headphones, namely the excellent Beyerdynamic T1 Generation 2, with able back up provided by Grado’s PS500s. Our resident MacBook Air (loaded with Pure Music media software) delivers the digits to the USB, while Naim’s talented NDS/555PS provides both analogue and digital feeds to the Copland. A Cyrus CD Xt Signature was also roped into action to test the digital connections. Our first impression of the Copland’s sound is one of an open, clean and precise presentation. We start with The Ghost of Tom Joad by Bruce Springsteen and find the Copland paints on an impressively quiet canvas. Those expecting to hear a trace of hiss from the valve-powered circuit are in for a surprise. This is a quiet circuit that gives little clue to its glowing technological core. What you do get is a sound that brims with texture and subtlety. From the harmonica that opens the track, to Springsteen’s world-weary vocals, the Copland lays it all out with admirable clarity. The edges of notes are crisply defined, yet at no point do we feel that there’s any excess hardness or an over-etched quality to the sound. Tonally, things are spot on. Those valves seem to add little in the way of excess richness or smoothness. We find the tonality convincing and wonderfully balanced. The DAC’s presentation is just natural, insightful and fluid. Move onto something that needs more drama, such as The Hand That Feeds from Nine Inch Nails, and the Copland continues to impress. The DAC 215 responds well, with the organisation to keep the various instrumental tracks and distortion noises in check while still delivering the piece with energy and drive. The Chord Hugo shows greater subtlety in aspects of timing and dynamics, but the Copland counters with an impressively open and tidy sound. Despite the distortion-laden instrumental backdrop the Copland stays easy to listen to over long sessions without overly sanitising the music. That’s a difficult trick few manage quite as well. We try the DAC 215 as a preamp, using our Gamut D200i power amp and ATC SCM 50 speakers and the results remain good. There’s an impressive level of transparency and the sound remains nicely balanced. Only the lack of a remote and the limitations of just a single analogue input stop the DAC 215 from being a totally recommendable digital preamp. Bypass the Copland’s preamp circuitry all together and use it as a dedicated DAC, and it remains a fine proposition. The sonic balance changes slightly, with a touch less body to the presentation and a slight loss of fluidity, but the sound stays insightful and articulate. 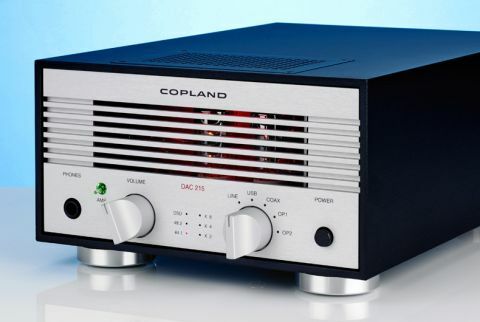 We like the Copland DAC 215. It’s smart, nice to use and well built. It sounds lovely too, particularly as a headphone amp. Given a good source, it delivers an immensely likeable sound, one that combines clarity and subtlety superbly. Highly recommended.